in tokyo, there is this lovely petite restaurant called “aila” where they serve “french colonial” style cuisine. their dishes are based on the french food with a bit of north african tastes. 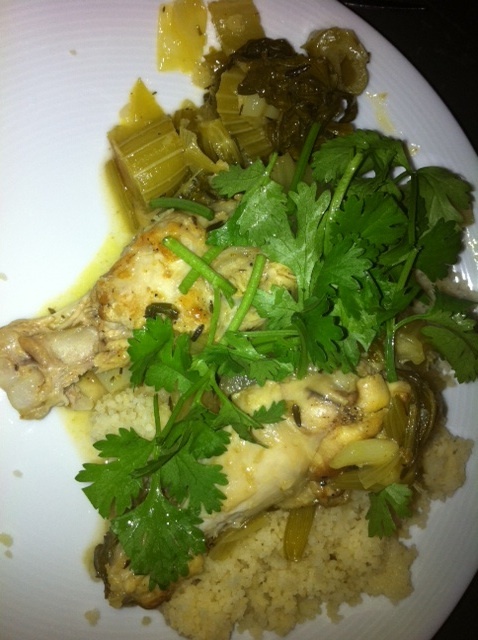 there are dishes like tagine, moroccan lamb confit and fish cous cous. i’m not very sure if the expression “french colonial” is politically correct, but it appears to be socially accepted over here, or perhaps people just don’t question it. since japan is a monocultural society where people are quite innocent and not very sensitive about issues involving diverse cultures, we sometimes get stunned at what we witness in our everyday life here in tokyo, just like this example. if some western people see it (including my husband), they would either roll their eyes or shrug their shoulders and move on, because they know that we mean it well. well getting back to the food topic – this dish, “chicken couscous,” is my own invention which is inspired by a dish i once had at aila. i can’t remember the exact flavour and spices they used, but i made it close enough to get the north african touch to the dish. 2. add the couscous and turn off the heat. mix them well, put the lid on and steam it for 1 minute. on the side, i served diced sweet potatoes (simmer them with a little bit water, a tea spoonful of honey and a tea spoonful of olive oil). 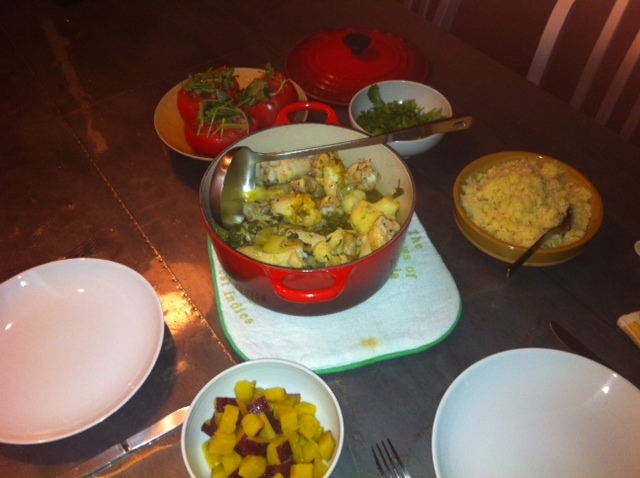 somehow the sweet potatoes go along very well with this chicken dish.